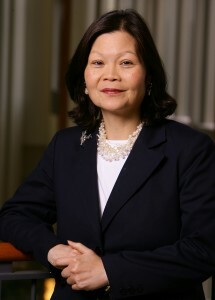 WASHINGTON (CNS) — Carolyn Woo, president of Catholic Relief Services, wants to see graduates of Catholic colleges become more involved in service — globally and even locally within their own parishes — and said university presidents should do more to make sure this happens. Woo spoke during the Feb. 3 plenary session at the annual meeting of the Association of Catholic Colleges and Universities in Washington. She said students hunger for the “inspirational challenge” to help others and said she believes “we as elders may not have given enough energy” to encourage them. Woo, who took the helm of CRS a year ago, previously served as dean of the Mendoza College of Business at the University of Notre Dame. CRS is the Baltimore-based overseas and development agency of the U.S. bishops. She said that while she was dean, she often wondered if the school was doing enough to form students in the faith. She would question if the graduates would be courageous enough, if they would know how to use power and if their faith was strong. She said Catholic colleges and universities should not just be competitive with other schools but should be distinctive because of their Catholic mission and thus be able to prepare graduates for service-oriented work. The key, she said, is in how Catholic social teaching is presented, which she feels is currently falling short. Woo urged college leaders to help their students “connect the dots” in terms of what the church can do in its outreach in health, education and care for the poor.